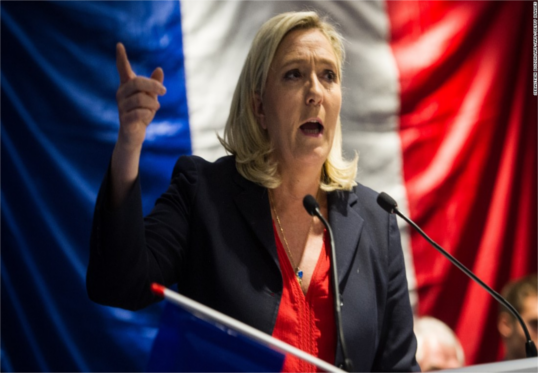 French far-right presidential candidate Marine Le Pen said Tuesday that plagiarised passages of one of her speeches were deliberately used to gather media attention ahead of voting this weekend. Le Pen copied parts of an address she made Monday from one made about two weeks earlier by one-time conservative candidate Francois Fillon, the former frontrunner who was eliminated in the first round of the election last month. Le Pen’s speech compared with Fillon’s became a social media sensation and led to speculation about how she could have made such a serious error. Speaking Tuesday night on the TF1 channel, she acknowledged the “buzz” and said she had wanted to draw attention to her similarities with Fillon, whose voters she is trying to attract. “We have in part the same vision of France as voters for Francois Fillon, of its greatness, the role that it must play in the world,” the 48-year-old former lawyer said. She currently trails in the polls ahead of a runoff vote on Sunday against 39-year-old centrist Emmanuel Macron which will decide France’s next leader.